When going out on a long winter ride your primary, if not sole, concern will be ensuring you are protected from the elements. However, when racing you want to remain as efficient and aero as possible, whilst not allowing the cold or rain to inhibit your performance. 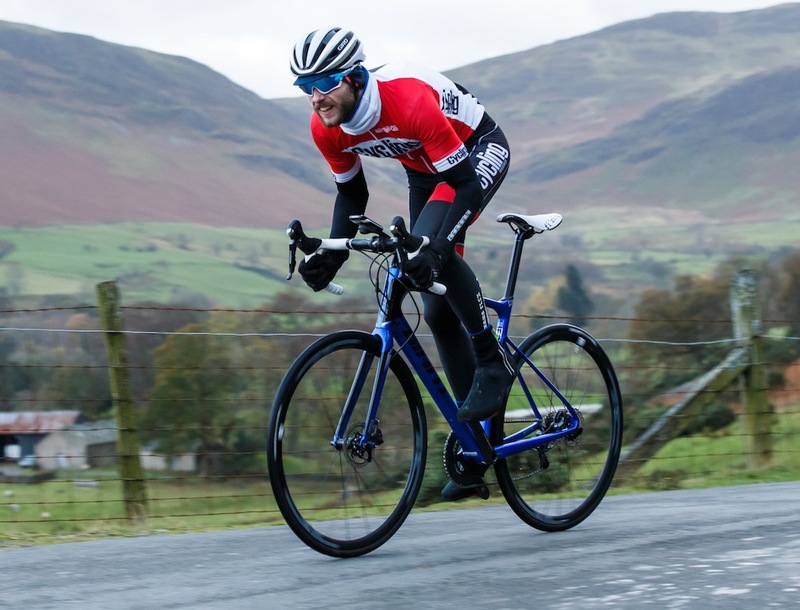 If racing there are several considerations that should impact your clothing selection: (i) What type of race and riding will be involved – is it a road race, criterium or closed road circuit, cyclo-cross or time trial etc? (ii) The next important factor is how long will you be out in the elements- warm-up, race and warm-down? (iii) Lastly, take note of the weather forecast and be prepared for the worst. Your extremities are often the first thing to suffer in the cold. 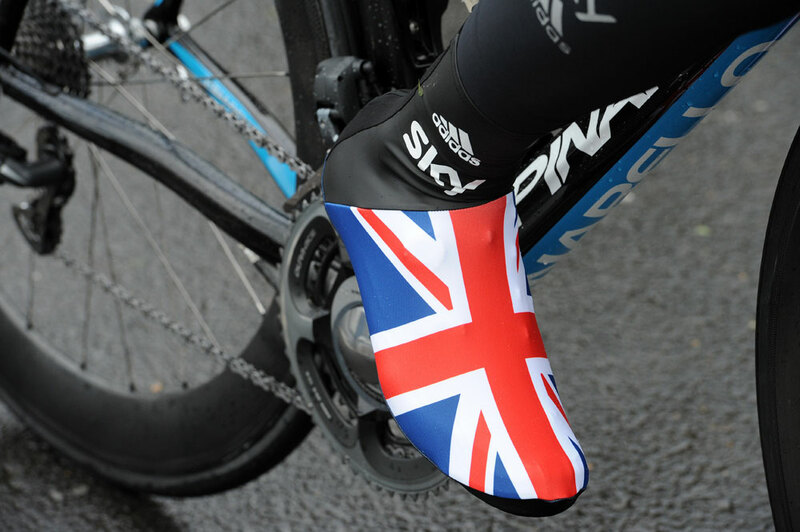 There are specific winter shoes on the market, but when racing you might prefer to wear your favourite trusty pair of shoes. If this is the case, the best option could be to pair aero overshoes with some thicker socks. 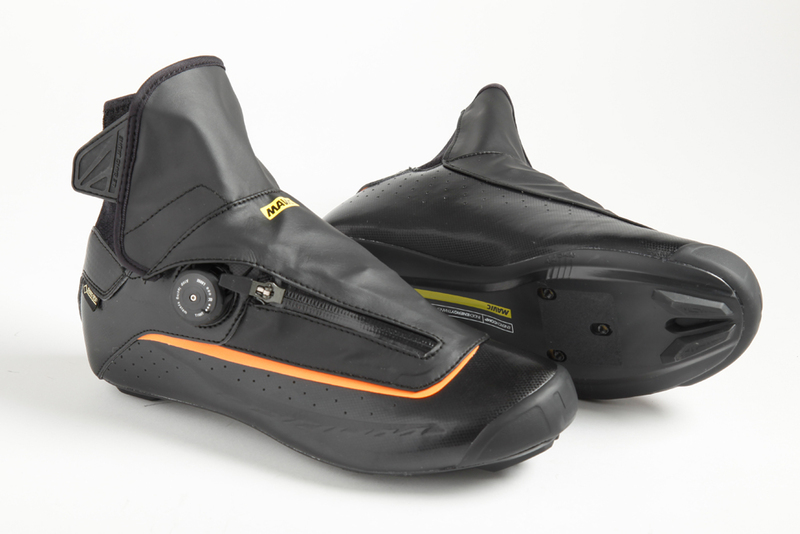 There are several types of aero and warm over shoes to choose from. Lightweight neoprene is a popular choice but it was the offerings from VeloToze, which are akin to wearing a balloon over your feet and said to be suited for cold or rainy days, that have taken the domestic time trial and road race scene by storm. 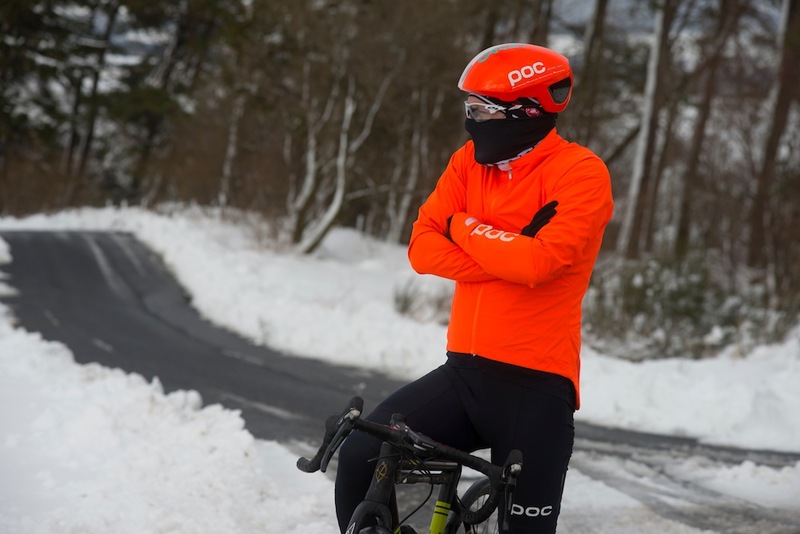 There are lots of options when it comes to protecting your legs from the weather, from waterproof leg warmers to thermal roubaix bib tights. The question is whether to cover your legs or not? It is largely personal preference and dependent on the elements.The fundamental consideration is that you are warm and comfortable – you don’t want to feel restricted. 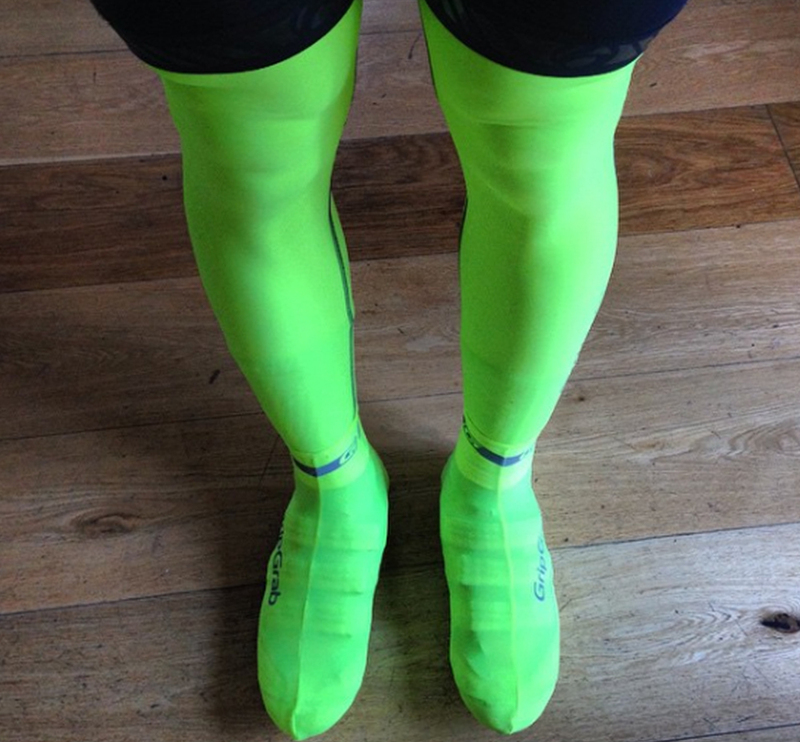 Most people will at least warm up wearing bib tights or wear leg warmers matched with a skinsuit. However, some riders are firmly against covering their legs when it comes to actually racing- prime examples can be found in cyclo-cross or early morning time trials where a popular alternative is using embrocation. How much faster is a skinsuit compared to a bib short/jersey combo? Generally, even if your leggings get wet they will still keep you warmer than bare legs. Although, especially in torrential rain, it can be advantageous to have bare legs as leggings that are soaked could increase the chances of you getting a chill or give you a feeling of ‘dead’ legs. At Milan San Remo in 2013 Mark Cavendish and many others took off their leg warmers despite the continuing torrential rain and dropping temperatures. Keeping your hands warm and dry is fundamental. 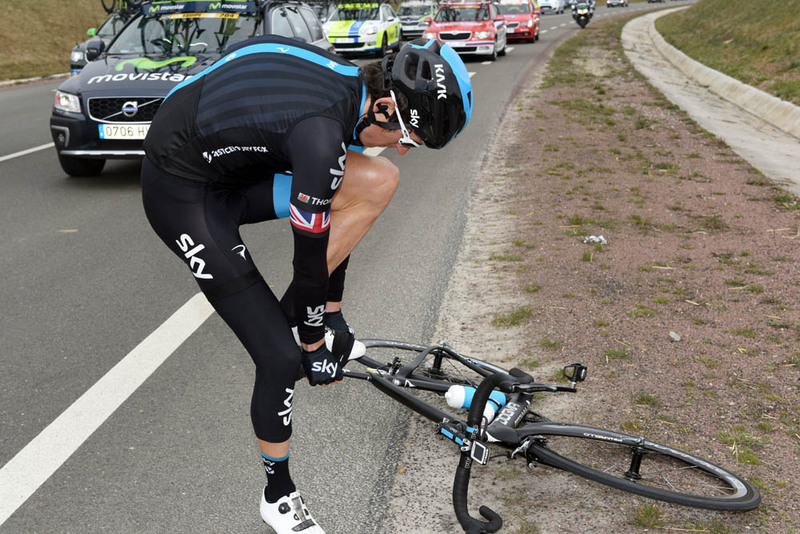 If you can’t grip the bars, or even more importantly grasp the brakes, disaster will strike. There are heavy duty winter gloves for the most extreme days or lighter more stream lined options for milder days. 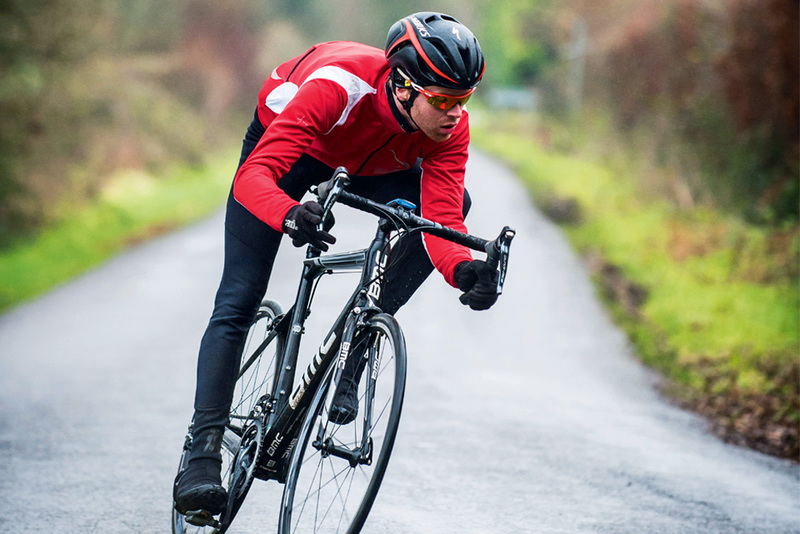 Since it is genuinely accepted that your bike accounts for 20 per cent of your drag and your body the remaining 80 per cent it is ideal to have close fitting clothes – you don’t want to have a garment that flaps in the wind. Road race skinsuits are becoming more and more popular. There are even thermal skinsuits available for winter racing. 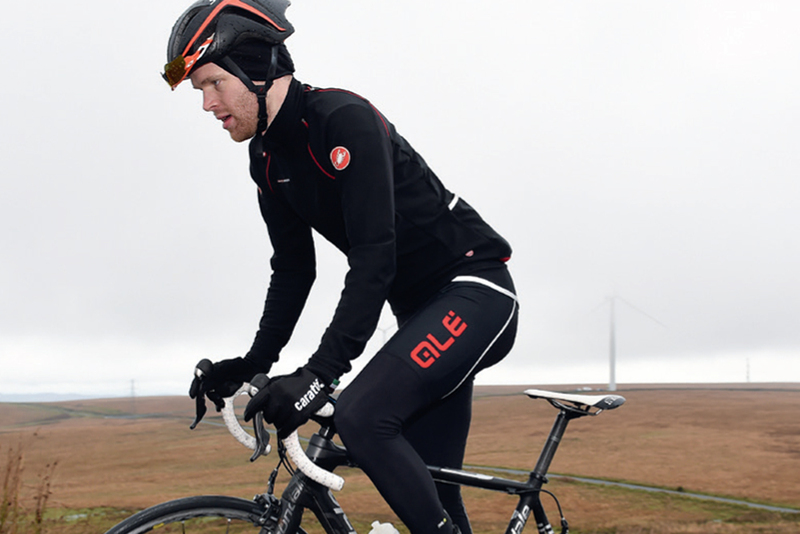 If it is too cold for your skinsuit, a good fitting long sleeve jersey and a windproof gillet is a good idea. 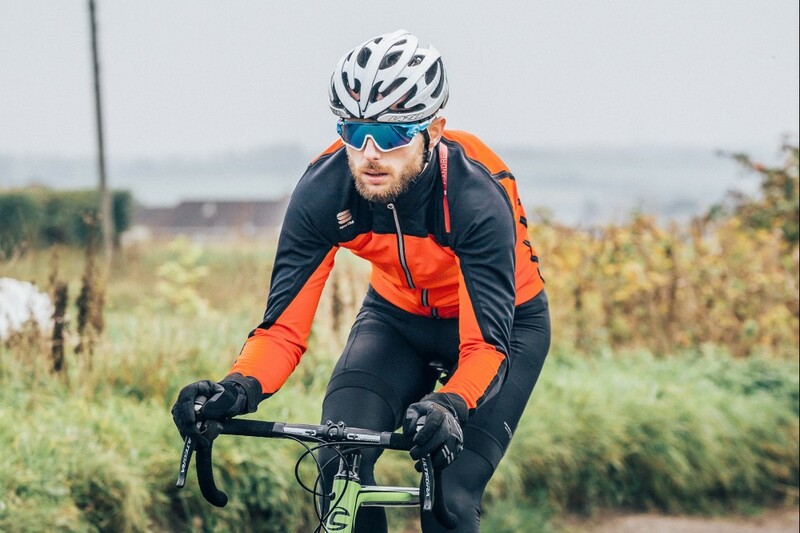 However, if you really want top end performance – in regard to warmth, protection from the wind, good level of water resistance along with a good fit – you’ll struggle to beat the Castelli Gabba. On the coldest days you can always layer up, but be aware that when riding hard you will get hot and you don’t want to overheat. 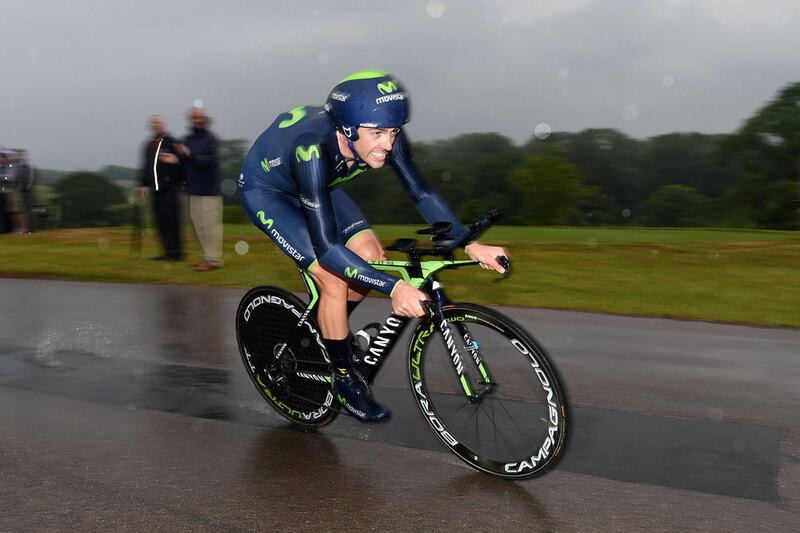 In heavy rain a good quality, race-cut waterproof jacket is a great idea. You want a rain jacket to have a snug fit without being restrictive; simultaneously keeping out the rain and being breathable enough so that you don’t overheat; and, ideally it will be packable to allow you to stow it away in a back pocket if the weather starts to improve. Unlike covering up your lower limbs, nearly all riders will cover their arms. The main reason being that compared to your legs your arms will hardly move. You can obviously opt for a long sleeve winter jacket or jersey. Another option is to choose arm warmers. In the past these have been primarily focused on autumn or spring riding, but now there are lots of thick thermal and waterproof options. The main consideration is warmth and comfort. You don’t want to choose a pair of arm warmers that are too tight, especially around the elbow, as this can become extremely uncomfortable very quickly. A snood or buff can make a massive difference when the wind is strong and the rain is lashing down. When needed you can pull it up over your face, alternatively you can slide it down to just cover your neck. Protecting your eyes from debris in the winter is arguably even more important than in the summer. Due to the changeable light conditions, from bright early mornings with glare from the wet roads to gloomy dark days, choosing the best type of lens is crucial. Having a helmet which allows you to store your sunnies when they steam up or it is heavy rain is also a good idea. From an aesthetic point of view visors may not be everyone’s cup of tea. However, they provide more face coverage – protecting you from cold rain and hail; are more aerodynamic than sunglasses; and since they rarely have frames they can provide better peripheral vision. You lose a lot of heat through your head. Aero road helmets are often touted due to their aero attributes, but their reduced ventilation which can be prohibitive in the summer months can be beneficial – it keeps heat in and the reduced number of vents keeps the rain out. What is faster a road helmet or a time trial helmet? 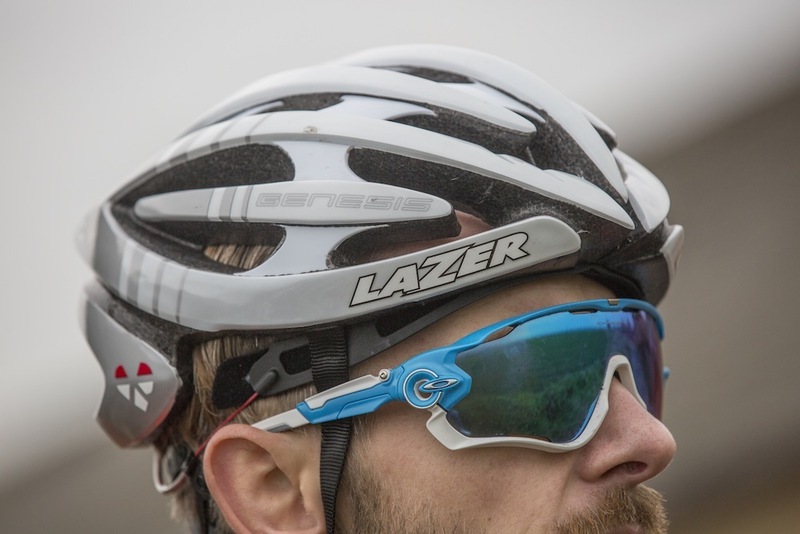 In addition to wearing a helmet with reduced vents, or a removable cover like the Lazer Z1, you could opt for a skull cap, a casquette or a thicker hat. A skull cap should help your head stay warm and won’t have any negative aero impact, whereas a hat with a peak may help keep the rain out of your eyes but it may not be as aero. Whether you are driving home or riding back, you need to consider what to wear. Some event headquarters will have changing facilities so check before hand and bring suitable washing equipment. After the race it is important to not get cold, aerodynamics are no longer such a concern – especially when you are sat in a car.